Thalophyte, nonvascular chlorophyll containing green plants are called algae. (i) Mainly fresh water organism. (ii) The structure is various – flagellate unicellular (e.g. Chlamydomonus), nonflagellate unicell (e.g.Chlorella), flagellate colony (e.g. Gonium, volvox) nonflagellate colony (e.g. Hydrodictyon), coenocytic (e.g. Caulerpa), filamentous (e.g. Ulothrix), parenchymatous (e.g Ulva) etc. (iii) Usually have two to four flagella without appendages other than delicate hairs or scales. (iv) Cell wall contains cellulose. Cellulose terminal complex in linear row. Sometimes xylans andmannans. (v) Autotrophic, photosynthetic pigments are chlorophyll a, chlorophyll B, carotenes, xanthophylls. Chloroplasts are of various shape and sizes but with never any chloroplast endoplasmic reticulum. (vi) Chloroplasts contain 2-20 thylakoid lamellae. Plastid with two chloroplasts envelope. (vii) Flagella attached at anterior end of cell. Flagella roots four cruciate roots with no scales, rhizoplast may occur, no multilayered structure. (viii) Mitosis closed with non- persistent spindle. (ix) Phycoplast produces new cross wall in cell division, cleavage may occur by furrowing. (x) Zygotic meiosis takes place. (xi) Glycolate breakdown by glycolate dehydrogenase. (xii) Urea breakdown by urea amydolyase. (xiv) The chloroplasts also contains eye spot in flagellate form. (xv) Asexual reproduction occurs by zoospores (motile spores), aplanospores (thin walled nonflagellate spores), hypnospore (thick walled nonflagellate spores) and akinetes (resting cells). (xvi) Sexual reproduction can be isogamy (fusion of morphologically and physiologically similar gametes), physiological anisogamy (different sized gametes), hologamy (young unicell functioning as gametes) and monogamy (fusion of non motile food storing larger female gamete and a motile smaller non food storing male gamete). (xvii) Green algae or chlorophycae are ancestors of land plants due to presence of chlorophyll a and chlorophyll b, carotenoid, presence of cellulose and pectin in cell wall, storage of starch, flagella in motile form. (i) Uses as food – Chlorella produces food rich in proteins, fats, vitamins, minerals. (ii) Uses in space research – Chlorella can be used in prolonged space fight for food, oxygen, disposal of carbon dioxide, organic matter. (iii) Uses as Larvicide – Chara gathers calcium over its surface and killed larva of different sides producing organism. (iv) Sewage oxidation tank – Chlorella, Chlamydomonus, Scenedesmus are some green algae which causes oxidation of sewage tank and clean up. (v) Antibiotics –Chlorella yields antibiotics called chlorellin. 1. Name a few colorless green algae. A distinctive set of microtubules lying parallel to the developing cleavage furrow is called phycoplast. 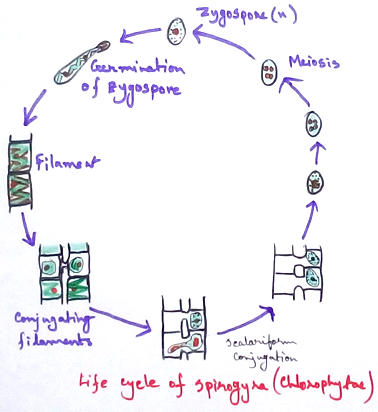 Members of chlorophycae exhibit phycoplast. 3. Where do we find walls composed of glycoprotein in green algae? 4. Which is the main carotenoid of green algae? 5. Name a green algae known as source of petroleum. Botryococcus. It is a microscopic green algae which produces good amount of hydrocarbons projected as a modern day source of renewable energy compound. 6. Name two exclusively fresh water orders of green algae. 7. Name some green algae that are parasitic on higher plants. Cephaleuros on Magnolia, Camellia etc.